Maxwell is part of a preschool co-op this school year. The group consists of five children, two girls and three boys. We do a weekly number, letter, color, and theme. For more of our preschool lesson plans, click here. It was my turn to teach preschool last week. The theme was cooking and baking along with the number 19, the letter R, and the color brown. 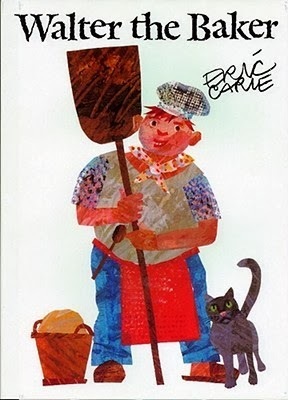 When I saw I would be teaching about baking, I immediately thought of Walter the Baker by Eric Carle. Our family loves this story about Walter's invention of the pretzel. Every morning, Walter bakes a batch of sweet rolls for the Duke and Duchess. But one morning, the cat spills the milk, and Walter substitutes water in the rolls instead. The rolls turn out like rocks, and the Duke is ready to banish Walter from the Duchy. But then he realizes he will miss Walter's sweet rolls, so he gives him a difficult challenge instead: "Invent a roll through which the rising sun can shine three times. It must be made from one piece of dough, and most of all, it must taste good." Walter works all through the night, and at last, quite by accident, comes up with the pretzel. Although the story is not based on fact, it turned out to be the perfect way for our little group of preschoolers to learn more about baking. On the first day, I arranged for a tour at our nearby Great Harvest. I don't know if all Great Harvests offer preschool tours, but this one was fabulous. Our tour guide, Sarah, was so nice. She was great with the kids and made sure they all had a fun time. First she read them a book about baking bread. She showed them the ingredients (whole wheat flour, water, salt, honey, and yeast) that go into a regular batch of bread. Then the kids donned aprons so they'd be ready to head into the kitchen and meet the bakers. The rule was, Keep your arms folded so you stay safe next to the hot oven. The kitchen was brightly lit and warm. Sarah showed everyone the big work table where the bakers get the dough ready. Then we saw a batch of bread come out of the ginormous oven. I couldn't believe how many loaves were in this oven at the same time. There were several racks just like the one you see, and they have a big timer to let them know which batch of bread is ready to come out when. Then we got to see the large wheat grinder where they grind the grain into flour, and also the huge bowls and mixer that they knead the dough in. They said that over the holidays, all of their bowls were full all the time. Each bowl had an extender going up the sides so that it could accommodate enough ingredients for 100 loaves of bread. Pretty crazy. Then we left the kitchen and went back to the table where Sarah gave each of the kids a small ball of dough. They pounded and twisted and molded and shaped their dough until it was exactly like they wanted it. Then they went back to the kitchen to politely ask the bakers if they would please bake their creations for them. On Thursday, I had all of the children at my house where we experimented more with baking. After our usual opening activities (calendar, pledge, weather, etc. ), we talked about our field trip to the bakery. I asked them if they remembered the ingredients that went into a loaf of bread. When they mentioned water as one of the ingredients, I told them we were going to read a story about one baker who tried to use water in place of milk for his rolls. We then read Walter the Baker. At the end of the story, we talked about how different ingredients are good for different things. For a loaf of bread, water is essential. For sweet rolls, it doesn't work as well. Ingredients work in combination with other ingredients, and sometimes you have to experiment for quite awhile before you find a combination that works. With those ideas going around in their minds, I did something very brave: I let the children create their own recipe. I first saw this idea on Tinkerlab, and I tweaked her suggestions to work with our group of four-year-olds. No, I didn't give five children free reign in the kitchen (maybe if you were only doing this with one child, you could allow a little more freedom). I pre-selected ingredients, but I tried to give them enough choices that the end result was still wide open and they felt like they were in control of the decisions. I went with flour, sugar, cocoa powder, applesauce, butter, eggs, water, milk, baking powder, salt, cinnamon, blueberries, chocolate chips and raisins. I told them the measuring cups were for the flour, sugar, blueberries, etc. ; the glass measuring cup was for the liquids; and the measuring spoons were for the spices, baking powder, etc. I just wasn't prepared to let anyone choose to add a cup of salt. We wanted to experiment, but even experimentation calls for a few boundaries. Each child got a turn to choose an ingredient/amount and a turn to stir. Then we added a few more ingredients by voting. I tried very hard to keep my mouth shut. But when one of the children chose to add a tablespoon of salt, well, I may or may not have filled it up only partway. However, in my defense, when another child chose two cups of water, I pressed my lips together and didn't say a word. As we neared the end, I just asked them about a few of the ingredients they hadn't considered yet and let them decide (by raise of hand) if they thought we should add them or not. Given that the batter was on the significantly runny side, I didn't quite know what to expect. But they actually baked up rather nicely and resembled a muffin when I took them out of the pan. Pour into greased muffin tins and bake at 350 degrees for 20 minutes. The children stretched and rolled and stretched and rolled, and then we twisted each one into a tricky pretzel shape. We talked about the function of yeast and how it helps bread and pretzels to be light and fluffy on the inside. We baked them up, and then I brushed them with butter and sprinkled them with cinnamon and sugar when they came out of the oven. The letter of the day was "R," so since we'd been talking about yeast and bread, we talked about other things that RISE. The children mentioned the sun and balloons. Water also rises during flooding or when the tide comes in. We made a cute little craft to show some of the things that rise. I gave the kids a piece of cardstock with pictures of bread, balloons, and the sun. They colored and cut them out. Then I attached a brad in the middle of each one and poked it through a precut slit in the black cardstock. Then the children could slide up the brad to make the sun (or the bread) (or the balloons) rise. Then we made a thank-you card for Sarah, who gave us a tour of Great Harvest earlier in the week. I made up this little gameboard with 19 squares. At the beginning of the game, I was going to have each child choose which number they thought would be the last one chosen. Then we would begin drawing cards. If they chose the number 5, they would put a pretzel on it. Then if they chose the number 14, they'd put a pretzel on it, etc. The last number drawn would be the winning number, and whoever made the closest guess to the winning number was, obviously, the winner. I know, not the most creative or exciting game, but I thought it would help them reinforce their number recognition. And that was our week of baking and cooking! What a cute group of kids and such a fun day! I need to get something going like that in our neighborhood. I can't believe how big Bradley is getting! He's still at that stage where he changes so much each time I see him.